This is perhaps the ultimate cliché of French home-cooking, a staple of a typical French diet. It is always exciting as you never know if it is actually going to rise and even worse, you never know how quickly it will fall even if it does rise. You can’t win, the soufflé will invariably either not rise, fall if you open the oven door, fall when you take it out of the oven. And, if it is still “soufflé” when you present it, there is the guarantee that it will fall when you cut it. No money back for this recipe, unless… unless you make the ramekin size and serve it in the ramekin. But really, you should enjoy the rise and fall, don’t take it too hard if it does not rise to Julia Child’s standard, it is for the taste after all, and the fun, not the picture! Rub a garlic clove cut in half at the bottom of a stainless pot, melt 1/2 cup of butter in the pot and add 3/4 cup flour and 2 tbsp corn starch. Whisk together till smooth, don’t brown. Add 2 cups of warm milk seasoned with 1/2 tsp salt and a small pinch nutmeg, whisk while you bring almost to a boil. Turn the heat off. Wait 5 minutes, whisk in 6 egg yolks one by one, and 100 gr of Gruyère or Swiss cheese. Stir. Transfer to wide bowl. Let sit for 1/2 hour on the counter covered with a dishtowel. It is just about the time to clean up and beat the egg whites by hand adding a pinch of salt before starting. If you have an electric beater, take a break. Incorporate the whites to the mix gently with a fork and pour into individual ramekins or two medium sized dishes. The dishes can’t be very big as you have to fill them to the rim. One large dish almost guarantees failure to rise. Pre-heat the oven to 380, put the ramekins in and turn down to 360. Keep a look-out for 25 minutes, but do not open the oven, I repeat, do not open the oven. 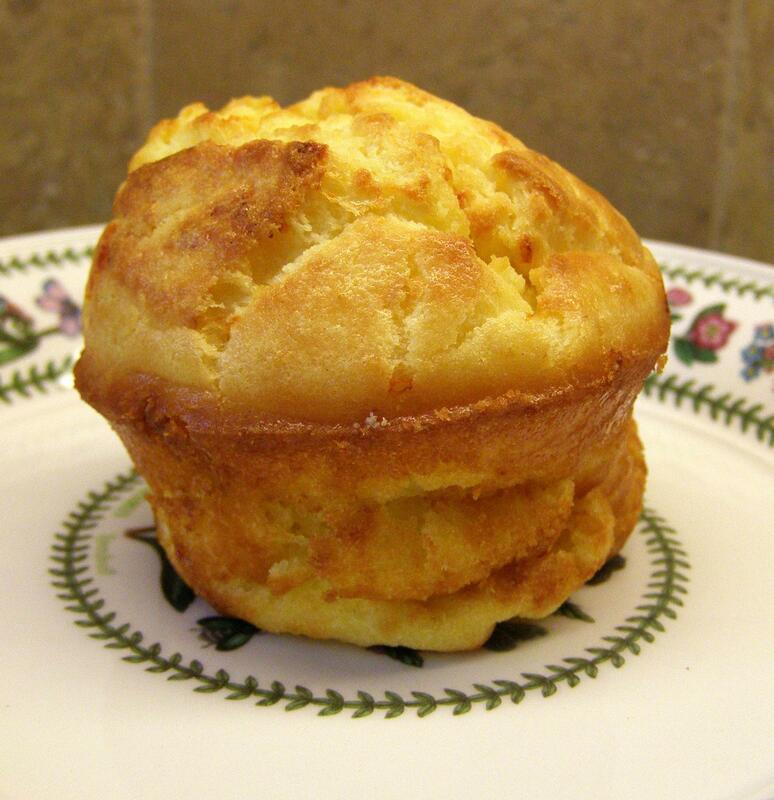 At this point, you need luck, but adjust the oven as needed to reach a golden brown tall soufflé. Remove from the oven, run to the table and eat immediately. It is your choice whether to “démouler” (take out of the ramekin) or not! Add fresh ground pepper and serve with a big salad. Tip:If you make the soufflé in small ramekins, do not put them straight on the oven rack but into a dish with 2 inches of water forming a bain marie, and line its bottom with a couple pages from a magazine or newspaper to help distribute the heat and prevent uneven bubbling. This entry was posted in Main Course and tagged Cheese souffle, food, french, French cooking, pictures, recipe, recipes, soufflé au fromage, souffle. Bookmark the permalink. This is quite a challenge! The one you made in the picture is lovely.